Motivated leader with strong organizational and prioritization abilities. Areas of expertise include Network Design, Security and Data and Telecommunications. Core competencies include Data, Video and Voice LAN and WLAN Networking, Next Generation Firewall and Network Management as well as excellent communication and time management skills. Goal-oriented Network Architect dedicated to high levels of customer satisfaction and meeting aggressive business goals. Responsible Network Architect proficient in Network Design and Implementation, Security Design and Management and Project Management as Team Lead. 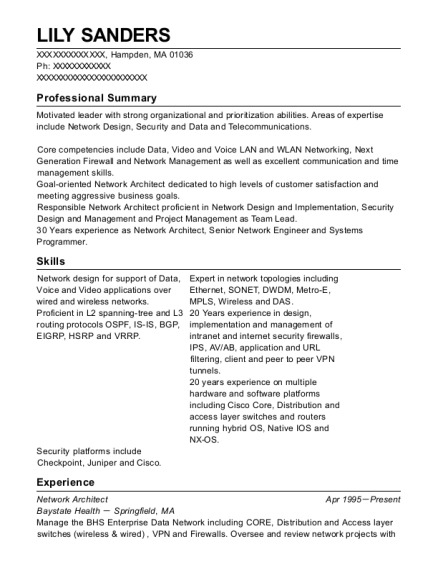 30 Years experience as Network Architect, Senior Network Engineer and Systems Programmer. Network design for support of Data, Voice and Video applications over wired and wireless networks. Expert in network topologies including Ethernet, SONET, DWDM, Metro-E, MPLS, Wireless and DAS. Proficient in L2 spanning-tree and L3 routing protocols OSPF, IS-IS, BGP, EIGRP, HSRP and VRRP. 20 Years experience in design, implementation and management of intranet and internet security firewalls, IPS, AV/AB, application and URL filtering, client and peer to peer VPN tunnels. 20 years experience on multiple hardware and software platforms including Cisco Core, Distribution and access layer switches and routers running hybrid OS, Native IOS and NX-OS. Security platforms include Checkpoint, Juniper and Cisco. Network Architect Apr 1995－Present Baystate Health － Springfield, MA Manage the BHS Enterprise Data Network including CORE, Distribution and Access layer switches (wireless & wired) , VPN and Firewalls. Oversee and review network projects with team members. Continual monitoring of network performance with relation to switching routing and security. Manage and enhance Firewall and associated IPS, AV, Bot and Appl/URL filtering. Consolidate events and provide tools to ISO team. Plan firewall and router upgrades and maintain high availability for intranet and internet access. Design and maintain client and peer to peer VPN tunnels with up to date algorithms for secure data transfer. Research and negotiate carrier contracts for dark and lit services for department relocations, new sites and bandwidth upgrades. Provide design and BOM for new and re-purposed sites infrastructure. Design and utilize DWDM network for separation of Enterprise, L2/L3 and consolidated compute traffic. Design and support Cisco UCS and IBM Pureflex consolidated computing. Designed new HOF (Hospital of the Future) building with state of the art infrastructure including complete PoE VOIP deployment and port level security. Senior Network Engineer Jan 1990－Apr 1995 Baystate Health － Springfield, MA Enhanced and developed the BHS Enterprise Data Network. Established standard ethernet and fiber cabling standards for associated vendors and BMC Engineering. Migrated standalone departmental BUS architected networks to stand twisted pair hub and spoke topology. Migrated hub topology to switched topology. Initiated and established first backbone site to site hospital network. Supported standalone departmental LAN, server and PC applications and networks. Negotiated and worked with carriers for lit service for backbone site to site connectivity. Developed cost efficient support of small office and department connectivity. Planned and migrated from VM and MVS to VM/XA and MVS/XA. Support of IBM Mainframe VM/XA, MVA/XA and VSE. Planned and started migration from legacy point to point coax controllers to Ethernet downstream PU's. Developed Disaster recovery plan and remote communications test with IBM at Sterling Forrest, N.Y. recovery center. Systems Programmer Feb 1986－Jan 1990 Baystate Health － Springfield, MA Maintain, enhance and support IBM Mainframe and Software and provide support to applications programmers. Configure and maintain IBM 3x74 and 3700 network controllers and VTAM networking. Provision user and mode tables for use with VTAM endpoints. Maintained CICS and TDS mainframe applications to support hospital information system. Planned and installed new IBM OS and migrated to a virtual mainframe running VSE, VM and MVS. Installed and maintained secondary Mainframe applications, ISPF, TSO, RASF Security and batch job control. Installed and trained operations staff to use CA JES2 and Power job monitors. Wrote programs for supplemental support of mainframe applications. Wrote procedures for operations staff to IPL mainframe OS and start secondary jobs. Developed Disaster recovery plan and testing. Programmer Jun 1980－Apr 1982 Package Machinery － East Longmeadow, MA Assembler and Cobol programmer for manufacturing company. Job duties in addition to writing code include some analysis and flow charting. 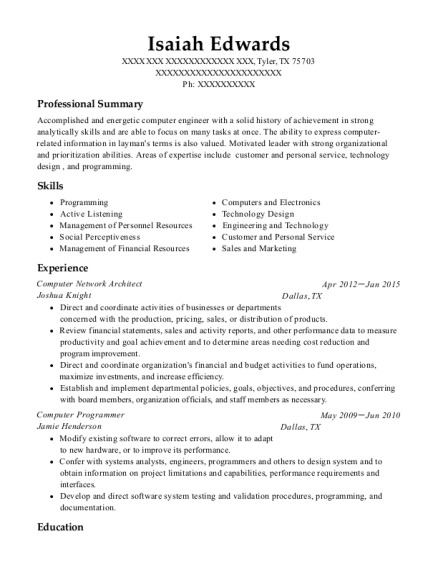 This is a resume for a Network Architect in Hampden, Massachusetts with experience working for such companies as Baystate Health and Baystate Health. 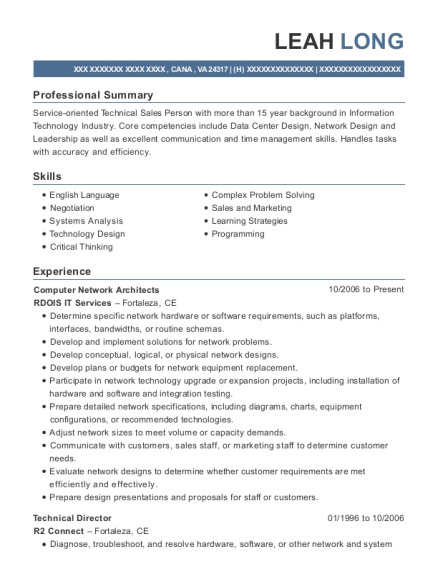 The grade for this resume is 0 and is one of hundreds of Network Architect resumes available on our site for free. 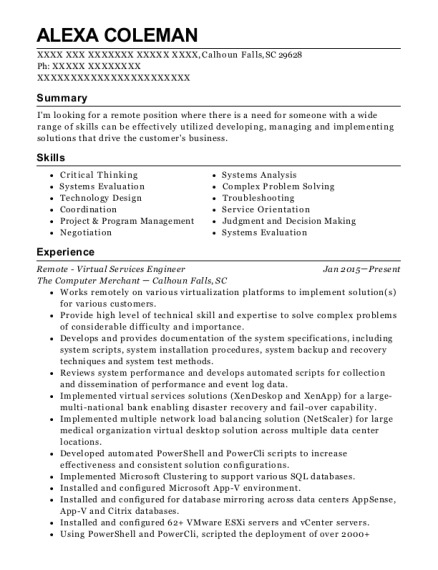 Use these resumes as templates to get help creating the best Network Architect resume.